Author bio: The author is a Men's Fashion Expert. Blurb: Men Can Learn About Art Of Coordination For Colors & Patterns To Look Sharp And Smart. 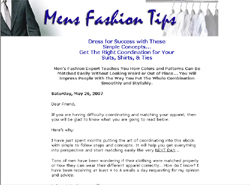 In "Dress for Success: Mens Fashion Coordination in Suits, Shirts, & Ties" ebook Men's Fashion Expert teaches you how colors and patterns can be matched easily without looking weird or out of place. You'll impress people with the way you put the whole combination smoothly and stylishly. You'll be learning the easiest and most straightforward knowledge to Dress for Success. It involves not just tons of research to get the right pictorials for correct illustrations but also encompasses a lot of author's own positive and negative experiences to create this men’s fashion resource. -How to visualize effectively the concepts through our use of actual pictures of suits, shirts and ties. -Conceptualize from the illustrations and explanations on how to play with colors to bring out fashion style. -Discover the art of choosing the right colors to coordinate your clothing for different seasons. -Wear the right dress shoes to coordinate with your attire. -Find out about the nice finishing touches that spike up your dressing style.